Apple’s stock sours, Microsoft’s soars. Say what?! Wall Street investors are enamored with a newly emergent tech company. It has nothing to do with posting selfies or finding a soul mate. The company is instead making billions of dollars selling cloud-computing and other technical services to offices around the world. Say hello to Microsoft, the 1990s home-computing powerhouse that is having a renaissance moment – eclipsing Facebook, Google, Amazon and the other tech darlings of the late decade. And now it is close to surpassing Apple as the world’s most valuable publicly traded company. Yes, that Microsoft. As other tech giants stumble, its steady resilience is paying off. That Microsoft is even close to eclipsing Apple — and did so briefly a few times this week — would have been unheard of just a few years ago. But under CEO Satya Nadella, Microsoft has found stability by moving away from its flagship Windows operating system and focusing on cloud-computing services with long-term business contracts. A brief period of trading Monday was the first time in more than eight years that Microsoft was worth more than Apple. Microsoft surpassed Apple again briefly Tuesday, before Apple closed on top with a market value of $827 billion, just 0.5 percent ahead of Microsoft’s $822 billion. Apple has been the world’s most prosperous firm since claiming the top spot from Exxon Mobil earlier this decade. Microsoft hasn’t been at the top since the height of the dot-com boom in 2000. Microsoft became a contender again in large part because Apple’s stock has fallen 25 percent since early October, while Microsoft hasn’t done any worse than the rest of the stock market. But the fact that it hasn’t done poorly is a reflection of its steady focus on business customers in recent years. Just a few years ago, Microsoft’s prospects looked bleak. The company was dependent on licensing fees from the Windows operating system used in personal computers, but people were spending money instead on the latest smartphones. In 2013, PC sales plunged 10 percent to about 315 million, the worst year-to-year drop ever, according to research firms Gartner and IDC. It didn’t help that Microsoft’s effort to make PCs more like phones, Windows 8, was widely panned. The iPhone maker had already seen its stock fall after reporting a mixed bag of quarterly results earlier this month amid fears about how the technology industry will fare in the face of such threats as rising interest rates, increased government regulation and Trump’s escalating trade war with China. 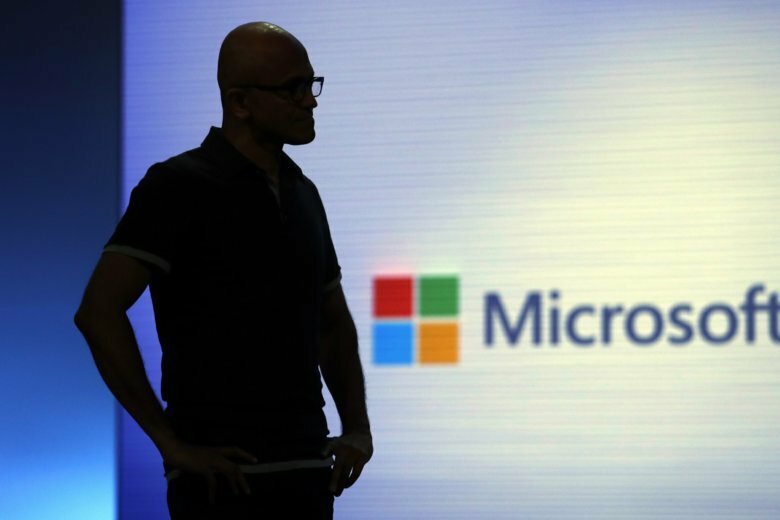 Morgan said Microsoft is outperforming its tech rivals in part because of what it’s not. It doesn’t face as much regulatory scrutiny as advertising-hungry Google and Facebook, which have attracted controversy over their data-harvesting practices. Unlike Netflix, it’s not on a hunt for a diminishing number of international subscribers. And while Amazon also has a strong cloud business, it’s still more dependent on online retail.